Some folks think we do nothing but pick on McFarlane Toys. They should love this, then, because Dreamworks giving the Shrek 2 license to Hasbro instead of going back to McFarlane was a huge mistake. Probably one of the worst of the year. When McToys landed the Shrek master license in 2000, no one even knew what the heck it was. McFarlane wasn't the first choice, but everyone else that had been approached passed on the opportunity to take on this risky property. Well, the movie turned out to be a smash hit and McFarlane Toys created some really decent figures to sell to all those new fans. Now that a sequel is on its way, a more "mainstream" company snatched the opportunity to cash in on the hype. Shrek 2 is obviously following its predecessor's lead in playing around with the world fairytales, as one of its new additions to the cast is that archetypal trickster, Puss in Boots. In the film, he's a famous ogre-slayer with Shrek in his sights. Puss in Boots makes for a nice little action figure. He's an orange tabby with darker stripes all over his body - think Garfield on Slim Fast. He's dressed like a musketeer and carries a tiny cat-sized rapier. The sculpt is, obviously, not as good as McToys could have done. Sure, he looks furry and the feather in his cap is detailed appropriately, but you can just picture how Todd's sculptors could have gone just a little bit further to make it look just a little bit better. Even articulation is sparse. Puss in Boots moves at the hips and shoulders, and his head is hinged to accommodate his hairball launching action. Yes, that's right, hairball launching. Move his left leg up and he opens his mouth to fire. It's basically a missile launcher like any other toy has, but it's just stupid. Hasbro could have left this out and given the figure a neck joint instead. One plus is that since the cat is small, Hasbro included a nice selection of fairytale creature pack-ins. 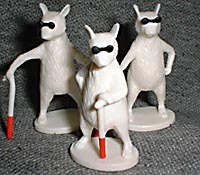 Not only do you get the three blind mice, you also get the handicapable Gingerbread Man. He's had his legs reattached since Farquad pulled them off in Shrek, but he's apparently given up the candy-cane crutch that was helping him walk. 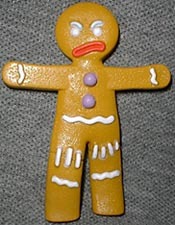 Gingerbread's sculpt really does make the figure look like a real cookie, and he's coated with something to make him smell like one, too. Fairly two-dimensional, GBM will not stand on his own, even though Hasbro tried to make that a possibility. His thin little feet are staggered to help provide a wider base, but McToys did a better job with him in their "Fairytale Fugitives" minifig set. Perhaps if you want to boil and bend his legs into a better position, you could get him to stand, but that might also wash away his freshly baked aroma. 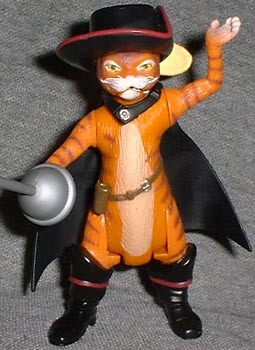 For a new character like Puss in Boots, this is an okay figure. Not as good as what McFarlane could have done, but that's no surprise. For the main cast, however, the folks who got a figure from the first film, stick with the ones you already have. Do you like your puss better with boots or without? Tell us on our message board, The Loafing Lounge.